Math Mania is an educational math game that helps strengthen your skills at mental addition. 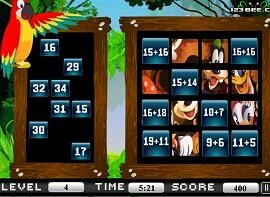 As fast as you can, complete the math sums shown on each level of the game. If you like this game, you might enjoy the other free online math games on this site, including Baseball Multiplication and Brain Tuner. HOW TO PLAY. To begin, click the Play button on the game screen. Or click the Instructions button on the game for a summary of the rules. Boost your mental math skills by adding math sums as fast as you can. On each level, there is a math facts bank on the left, in random order. On the right side are the sums, scattered randomly. Using the mouse, drag the math facts from the left to the correct sums on the right. Once you've matched all the addition facts with their sums, the level is complete. Each level is on a timer. The higher the level, the more time you are given. The faster you complete a level, the higher your score. This is an especially useful game for younger students to practice their mental addition skills. It can be played multiple times to improve calculation speed. There isn't enough time to write down your calculations. You'll need to perform the sums mentally for a maximum score. 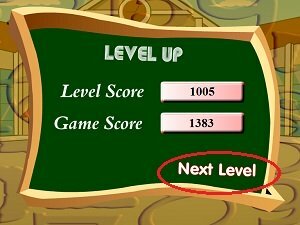 Between each level, the Level Up screen displays. It shows the score from your most recent level and your total score so far. To proceed to the next level, click the Next Level link on this screen. After the end of the last level, you can click Play Again to repeat the game, or close the game pop-up window if done. This educational math game has just 5 levels. If you're already very skilled at mental math, you may be able to complete all the levels without too much difficulty. However, if you or your child are weak at performing addition mentally, this game is a great way to improve that skill. The first couple levels are relatively easy and involve only a few single-digit addition calculations. The levels after that are more challenging. They involve two digit addition up to the 40's. For example, in Level 1 you might need to calculate 2+2=4. By Level 3, however, you might need to calculate 23+18 quickly. TIP FOR FASTER MENTAL ADDITION: When mentally calculating two-digit sums, use rounding when possible. For example, suppose you need to add 23+18. First subtract 3 from 23 to get 20. Think "20+18=38" then add back the 3... so you get 23+18=41. That might seem like additional work, but rounding actually saves a lot of time. Practice it a bit, and I think you'll see what I mean. Educational math games like Math Mania train important skills such as logical reasoning, quantitative reasoning, and arithmetic. Play math games often to boost your math skills! Game distributed by 123Bee.com. Used with Permission.